I’m aware of the controversy surrounding the guy. I don’t actually know if they made any additional changes to the dialog or anything, but this quest dialog cracked me up when I ran the 1-10 Panda area again for the second time. 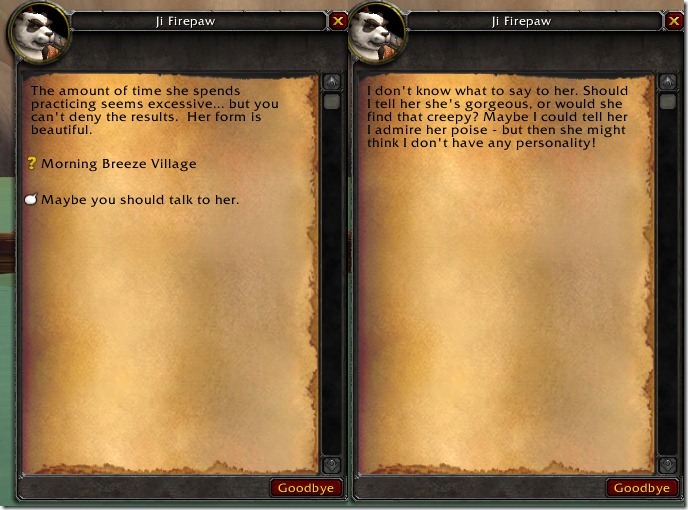 He’s referring to Aysa Cloudsinger, a female Panda who practices a separate Pandaren discipline. You can see her in the above shot meditating on a pole. I know full well the problems ailing this poor Panda. It’s okay Ji. I got some ideas for you. Heh, I don’t know. I wish I knew the answer to this question! Can anyone help a Panda out? Imagine an oversized owl with a golden exclamation mark over her head. Her clawed feet are a’tappin’. Her head’s swaying round, beak held high. She clearly expects people to stop and listen to her woes. People regularly socialize with oversized owls, after all. Especially any that look like they’re damsels in distress. Maybe not damsels, but distress. Yep. that thar owl be giving you a quest. You have until midnight PST on Friday 16th July to post a comment. On Saturday I’ll do an in game /roll of however many comments this post gets. The number I get in the roll will be the winning comment, and therefore article idea. For example, if I get 8 replies with a suggestion each, I’ll /roll 1-8. If the roll result is 5, I’ll write an article based on commenter #5’s suggestion. And just to put the icing on the quest I’ll update this post with a screenshot of the roll, so you guys know I’m not pulling some funky owl magic. So. Let the ideas and challenges begin! What do you want me to write this week? Post before Friday, as this article will self destruct… all right, not really. But the owl will stop peering questioningly at you, then. By the way… keep this under your hat, hush hush and all… but I’ll also be putting up another brief post later today with some small but happy MMO related news. Keep checking! Blizzard quest developers, please read this. I’m writing a request and I don’t know if it’s in your plans for Cataclysm. I want to share with you a story when I started out as a wee, young Priest. After farming for hours on end in Darkwhisper Gorge and taking down Majordomo Executus with my guild at the time, I had finally united The Eye of Divinity and The Eye of Shadow. All that remained was to complete the Balance of Light and Shadow and I’d get my Benediction. That quest singlehandedly taught me how to raid heal. How? Eris Havenfire, the quest giver was not able to save the peasants that were trying to escape from Stratholme. I was asked to try to do what she could not do: Save as many peasants as possible. If 15 peasants were lost, it was game over. I remember standing on the hill frantically Renewing everyone that was going by and Flash Healing those who were at critically low health. Even though I had already cleared Molten Core a few times, this was truly a humbling quest. Peasants would spawn at different places. They would have varying degrees of health. Some would move at different rates. Others would be pursued by skeletons. Many were afflicted with a disease. And it took me a disappointing 14 tries before I finally managed to get through it (Oil of Immolation did the trick). Target priority – Skeleton archers were picking off peasants as they ran by and the diseases weren’t helping either. Priests had to know who was going to die first and heal accordingly. Just because some peasants were below 50% didn’t mean they were going to die. Oftentimes, it was the peasants at full health being drilled by Skeleton Warriors and suffering from diseases that were the ones in danger. Spell priority – If all you have is a hammer, every problem is going to be viewed as a nail. I had to rethink which spells I wanted to use next. Not every healing problem is best solved by repeated use of Flash Heal. While yes it does bring peasants above the near death zone, it wasn’t the best answer all the time. Abolish Disease or Renew would have been the better choice. Reading the health bar – With the health bar up, I could deduce how much each weapon swing was hitting the peasant for. Knowing this, I was able to figure out how much time a peasant could go without healing before they fell. It played a big part when I prioritize healing targets. Value of HoTs – Renew was a spell that I often thought was fairly useless. I could wait out the whole duration for it to work its magic or I could drop a quick Flash Heal on the target and call it a day. With so many targets, I needed to use Renew. The point of Renew was never to top off the peasants. It was to keep them alive long enough for them to get to that white light. I rightly gauged that a Renew on a peasant would be enough to keep them alive from Skeleton Archers as long as they weren’t afflicted with a disease. Mana management – At the time, I had to rely on downranking spells and using potions to maintain my mana supply. At level 60, I had about 1700 healing power (which translates to a little under 600 spellpower by today’s numbers). My mana regeneration was a paltry 150ish MP5. Holy Nova would clear out skeletal mobs with a few ticks but it would also trash my mana pool. I had to keep a very close eye on the mana bar and use cheap spells when I felt I could get away with it. Cleansing – Another early mistake I had was not removing diseases and thinking I could simply brute force heal the damage that was done. Now that might be fine with 1 or 2 targets. But when you’re trying to save 50 peasants where most of them have been infected, getting rid of the infection might be considered a smart move. 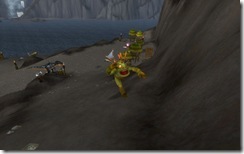 Shaking out tunnel vision – Unfortunately, there are no raid frames to use. I had to rely on constant toggling of name plates (and all I had were the default ones at the time) in order to look at their health. I’d often be so glued to my raid frames in Molten Core, I’d miss the obvious player who had been targeted with Living Bomb (an ability where the player explodes and deals massive damage to anyone else around them). I was able to see which peasants were likely going to be in danger first simply by watching which ones were being chased by skeletons. Just follow the path since they run in a straight line. This bought me a few extra seconds since I could anticipate their targets easily. 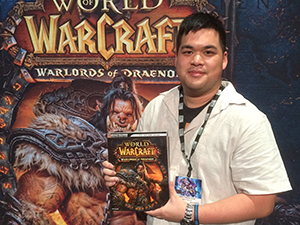 I understand that there it’s against the current WoW philosophy to introduce class quests again. But I don’t think there’s anything wrong with inserting in role related quests. I’d like to see a Shaman, Paladin, or Druid try their hand at that quest. I imagine that they would take a completely different approach. It would be difficult to balance the four healing classes around such a quest and I wouldn’t dream of suggesting where to start. But at the very least, please consider it. I wouldn’t have become the healer today had I not completed that quest. The Rhok’delar questline taught hunters how to kite (I think). If there’s any Vanilla hunters, how difficult was that quest when you were 60? What was it like then? This would be simple Warcraft Mechanics 101 type quests. Tutorials disguised as quests that can help new players L2P! Quests that underscore the basic mechanics of the game would do wonders for new players who don’t understand different concepts. The random dungeon tool exposed me to players who had no idea what threat meant or what CCing was. For tanks, maybe a quest on how to generate threat. Or how to maintain threat on multiple mobs as they try to juggle them around pylons (like a driver’s test). For DPS, a quest on the basics of crowd control (if applicable) or on how to kite (possible for some classes but not others). For healers, maybe a recreation of a similar scenario above. Healing multiple targets as they try to run away. How could it be worked into Cataclysm? Perhaps the town of Healshire is about to get overrun by Deathwings minions and the job of the healer is to protect the evacuees as they make a run for a portal. I don’t know but I’m sure it’d be easy to insert that lore. Please. Recreate that experience. A new generation of players would be all the better for it. This is a guest post by Sientina discussing earning gold in WoW as a healer. I’m Sientina, and I heal things to death. You see that warrior over there? He’s been trying to kill me for the last 4 minutes and I’m healing away all his damage, waiting for help to arrive. Sure, I could probably kill him… eventually, but I rolled a healing class for a reason. I don’t kill things. I don’t grind elementals for eternals. The thing is, raiding takes its toll. I have reagents to buy, armor to repair, and hair to cut when my old style isn’t working for me anymore. What’s a girl to do when she has money issues and no sugar daddy? I could just heal the daily heroic for cash but if I don’t want to commit to a full heroic run, I can do a few dailies instead and still have the gold for the raid tonight. Besides, have you seen those dungeons? They need to fire their cleaning staff. I end up with more cobwebs in my hair then hair products, and I use a lot of hair products. For a style this good, there needs to be money rolling in. These dailies keep my hair free of cobwebs and my gear free of blood and gore. Stop by your respective airships and pick these quests up. Capture More Dispatches / Keeping the Alliance Blind – shoot down 6 scouts just west of Aldur’thar. That’s Abominable! / That’s Abominable! – Kill an abom in the broken front for his guts and use your newly made Frankenstein creation to blow the undead to pieces. The Solution Solution / Volatility – Loot some helms, armor, and bones and blow a Frostbrood Skytalon sky-high. If you’ve unlocked enough quests to have the tabard of the Knights of the Ebon Blade, head to the Shadow Vault for 2 more dailies. Vile Like Fire! – Grab a proto-drake and burn 8 buildings. You can re-burn something already on fire, so it doesn’t matter how many others are around. Shoot ‘Em Up – There are two buildings with harpoon launchers on the balcony. Pick a weapon and kill 15 drakes. Make sure to grab group with anyone else at a harpoon, you’ll both be done sooner. Both Alliance and Horde have their own assault point in Ymirhiem. Join them to help their cause in a non-killing sort of fashion. Horde, you’ll report to the northern edge while Alliance will be on the eastern side. Assault by Air / Assault by Air – Grab the transport and hit the spear guns with the blinding shot to stay alive til all four of your infiltrators are dropped. King of the Mountain / King of the Mountain – Jump up the mountain and plant the flag. You can click for your next jump before you land so you can scale vertical walls with ease. Appeasing the Great Rain Stone – Hop around with your little green friend and look for sparklies on the ground. After he digs them up, loot them. Song of Fecundity – Go west to the Maker’s shelf and blow the horn around 8 piles of dirt. Song of Reflection – Go to the top of each Pillar and use the digeridoo at each crystal. Chicken Party! – Click on 12 chickens or net big groups of them. You don’t have to dismount to net or gather the chickens up, so catch them rodeo style. You will have to unlock the Sons of Hodir quests to get these. Part of them are Sons of Hodir Dailies, and will give you rep towards your shoulder enchants. Others are from Brunnhildar. Talk to Gretta the Arbiter to start them. Thrusting Hodir’s Spear – Only available at Honored. 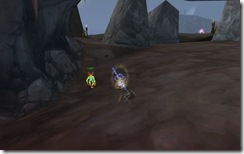 Find a wyrm and slay him using the special cast bar. Once you get the hang of killing the wyrm, it’ll take you about 5 minutes tops for 16 gold and 500 rep.
Everfrost – This isn’t a daily, but when you’re out and about and you see an everfrost chip, loot it. Its a free 13 gold and then 7 gold for repeats. You can do this as many times as you find chips and sometimes someone in general chat will be willing to pay you for the location of one. If not… more rep for you. Back to the Pit – Grab a warbear and beat 6 other bear-back riders in combat. Maintaining Discipline – Beating slaves couldn’t be easier. If they choose to fight back, you might have to kill one or two. 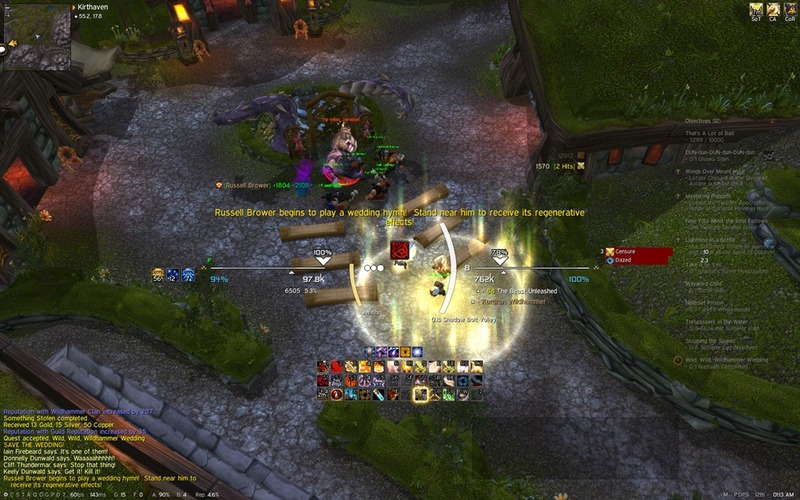 The Alliance and Horde fight over the Blue Sky Logging Grounds. Thankfully we can assist. Pieces Parts / Making Repairs – Loot gears and springs off the ground. The opposite factions npc’s won’t attack you, but enemy players might. Life or Death / Overwhelmed! – Bandage 15 of your forces. Shredder Repair / Shred the Alliance – Shredder time! Use the speed boost and get your machine out of there. As a note, the keys you get from the quest reward will let you use shredders down in Venture Bay. Defending Wyrmrest Temple – Fly to the shrine, disable it and kill all opposing dragonflight in your way. Simple? Yes… but you can up the ante by trying to complete Rapid Defense as well. With dailies to keep this girl independent and her hair the best in Dalaran, I’m as carefree as bird. If you’re needing a break from that dreary old dungeon crawl, try a different way to get the gold you need. Unless the main tank is cute and available. That’s a different situation. What do you do when you are asked to do something that goes against your beliefs? How do you behave when you principles become compromised? When your friends become enemies and your enemies become friends, who can you turn to and who can you trust? Never in the history of Dwarven-kind did we ever have reason to aid our enemies. When Dwarven children were growing up, their parents would paint them the horrors of the various monsters and beasts around the world. As a Priest, I was taught to go after them and defend my country and my right to live as a Dwarf. We did whatever it took to safeguard our borders. From the mountains of Redridge to the Marshes of Dustwallow I went. Our objective to wipe the evil fish off the face of the planet. Every Murloc, slain. Every hovel, leveled. Any trace of Murloc, annihilated. Our path was clear and merciless from the day our training ended. I should’ve known priorities had changed. Quel’Danas offered the first clue. Freeing Murlocs from the clutches of Naga magic? Why not wipe them both out and be done with it? I was confused at first. I thought there was more to this. Like a faithful and obedient Dwarf, I followed my orders to the letter. 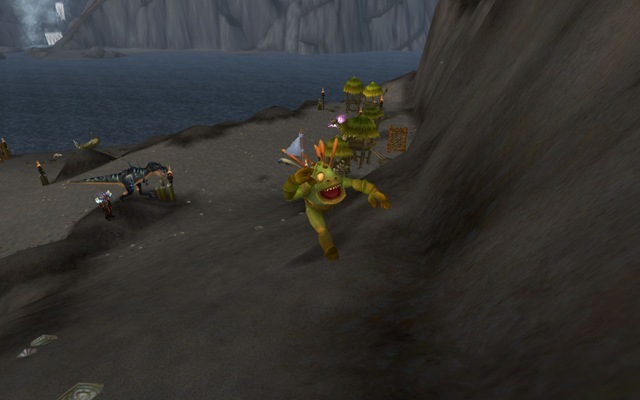 Upon reaching the shores of Northrend, I was tasked to assist yet another group of Murlocs. I had trouble reconciling this with beliefs that have been grounded into me since I had gotten my first whisker at 6 months. Murlocs. We are helping Murlocs fight other Murlocs. 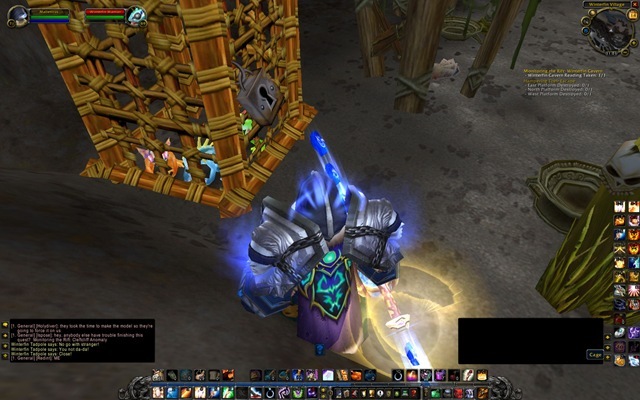 I have gone from mindlessly bringing whole Murloc villages to the ground to risking my life to rescue Murloc Tadpoles (children) from captivity. I infiltrated a cave under the guise as one of their own and led a small strike force deep into the heart of enemy territory. Silencing the guards were easy. Extracting the Murlocs held hostage were a bit more of a challenge. For the first time in my career – nay, my life – I fought back to back with a Murloc covering my flank and I his. My Apostle more than held its own effortlessly cleaving the tainted Murlocs in half (after some practice from being rusty at least). In the end, the operation was ultimately a success with zero casualties. However, going on these joint missions have left a sour taste in my mouth. I wish to be rid of them as quick as possible. I would much rather be supervising Gnomes. I now question my ethics. To whom do I owe my allegiance? The Dwarven banner or to myself? This is the difficulty that I must wrestle with internally. Now I have a vague idea how Americans thought when they first executed joint missions with the Russians. Honestly, what a brilliant idea by Blizzard. I stepped into Heroic Botanica yesterday for the first time (and probably the last). I never would have gone in there otherwise if it weren’t for the daily quest. After a few bumps and bruises in the beginning, we managed to clear it with some minor difficulty. Reward? 40G. After repairs? 33G. Not a bad haul. I’m feeling sick right now so I’m not quite at school yet (2:30 class). At the moment, I’m sitting at home and about to get underway in Heroic Black Morass. Of course, the Hunter just HAS to open fire on Horde near the summoning stone and my group gets picked apart with our corpses being camped. Damnit Hunters, stop being so trigger happy! Does the Zul’Aman bear boss have a reset bug? I was in there yesterday, and we wiped for a few times while our tanks were adjusting to his debuff. Before we knew it, he reset himself appearing at the beginning of the instance. He was not able to be aggro’d. In fact, he just stood there. Is that the way it’s supposed to be? My group had JUST gotten a handle on things, and if we had another few shots I know we could’ve killed him. At least the instance will reset quickly. EDIT: Forgot to mention that I wasn’t referring to reseting the encounter. After a few tries, the Bear boss will despawn and move to his first position where he stands on top of a ledge overlooking the area. Problem here is that he won’t aggro onto the group. He’s targetable but invulnerable. He doesn’t move and the script doesn’t seem to trigger. We tried running out and back in to see if that did anything, but to no avail.